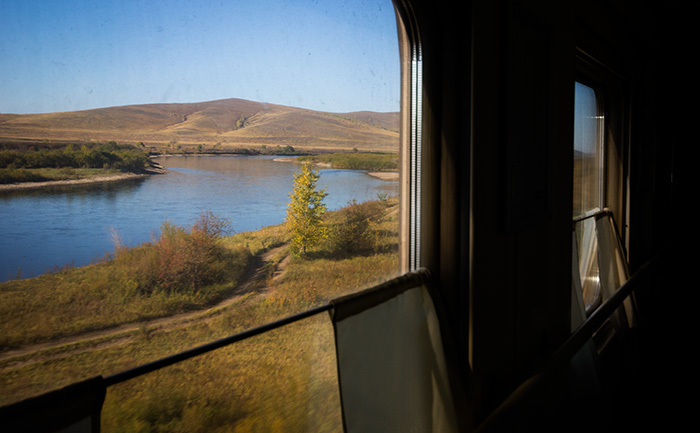 Dear friends, this time I write about the Trans-Siberian, the train that crosses the whole of Russia. 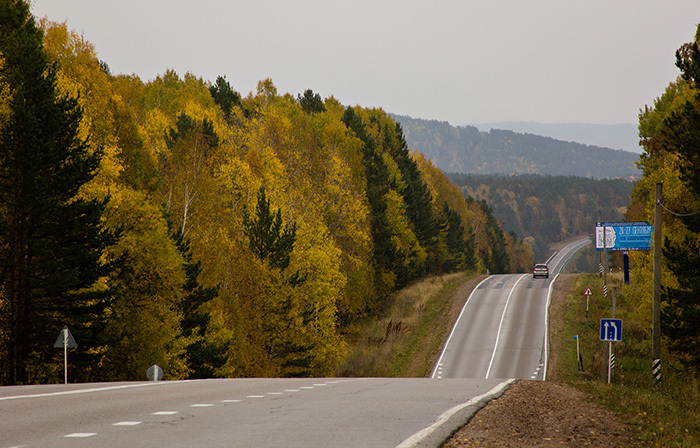 Some of its branches reach Mongolia and China, however, the original stretch, more than 9,000 km long, is the one I did: Vladivostok – Moscow, built at the end of the nineteenth century. To cover the entire stretch, the train takes six days and a half. Since it passes each two days, it is possible to go down and take the next one, or jump on other trains running in the meantime. 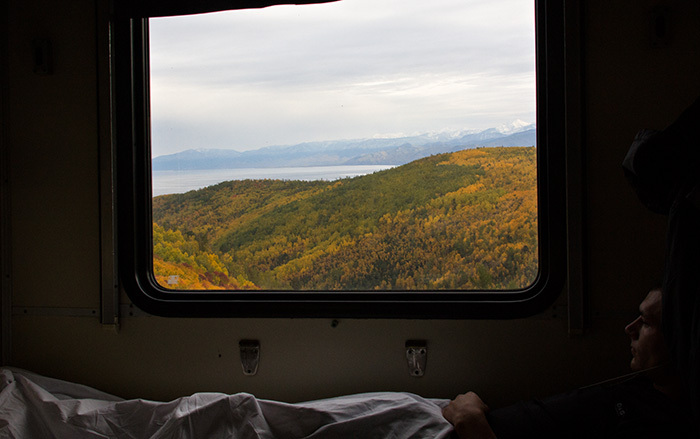 My journey lasted three weeks, I flight to Moscow, where I stayed a couple of days, and from there I took a domestic flight of nearly nine hours to Vladivostok, from where I returned to Moscow by train, through the vast Siberia, “the sleeping land”. 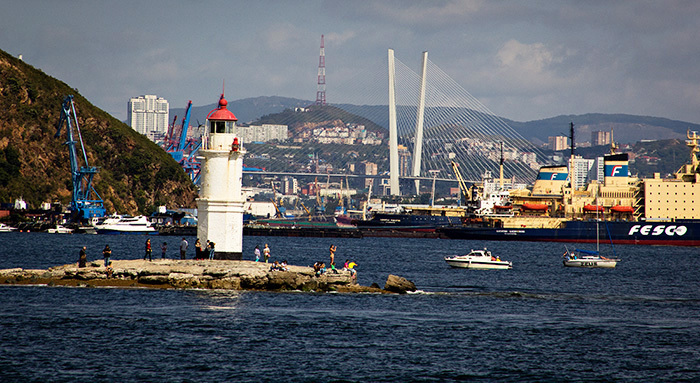 Vladivostok. 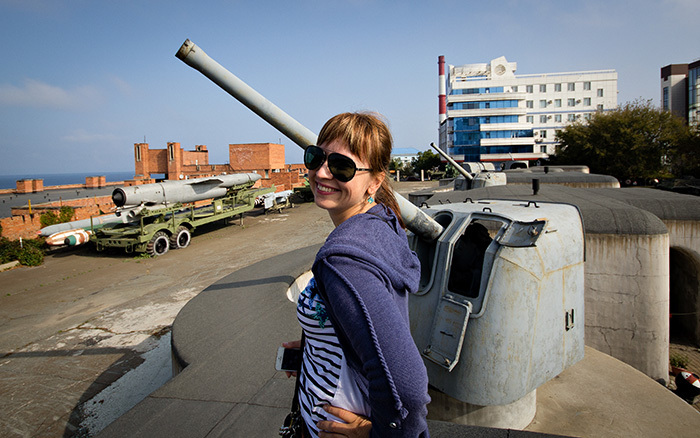 Founded as a military fortress in 1860, later become also the main Russian port on the Pacific Ocean. 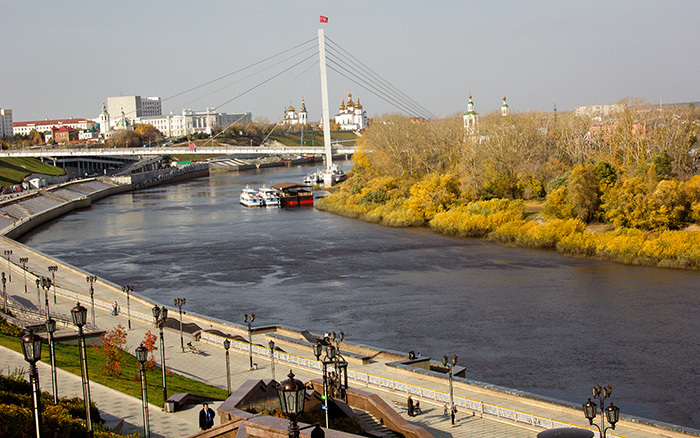 It is in fact the Russian capital of the East, the main festivals of art and cinema, sporting events, and the most important international conferences involving the Pacific area take place here. It s a nice city, with roads going up and down on the hills and with two spectacular bridges that connect to nearby islands. Separated by a short stretch of sea from Japan, it is just about two hundreds kilometers from China and North Korea of the famous Kim Jong-un. Since Vladivostok was the last city to surrender to the Red Army, in 1922, I thought it was a good idea to start from here, and going backwards westbound, making the trip with the declared aim of re-converting these stubborn Russians to Communism. But how? 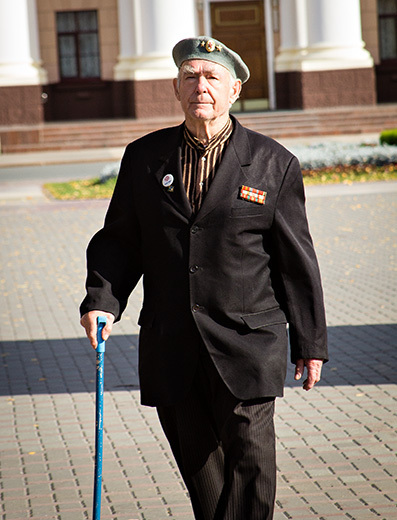 – You may say – communism in Russia was a failure! He left the misery that was there, adding also an oppressive bureaucracy and police apparatus! I know, but the point is that when there was communism in Russia, things were better for us Western European workers due to terror that inspired to the capitalist pigs, forced then to give more. So: reintroduce the communist monster in Russia and simply let that its specter restarts haunting Europe. That’s the idea. Let’s see if I can actualize. Yes, I know. But I like AC Milan. Olga, who hosted me in Vladivostok, through Couchsurfing. Very very kind, he took me around everywhere with his car and explained everything about the city. Here we are in one of the many bunkers and forts now converted in museums, along with military ships and submarines. As I said, Vladivostok has always been a very important military area and until 1992 foreigners were not allowed to visit it! Certainly not the most beautiful woman in the world, and actually a little dreadful, and in fact we must respect her: she is the “Provodnitsa”, the boss of the wagon. Together with another lady, equally handsome, she had the total control of us passengers of the number 5 wagon on the stretch Vladivostok – Ulan Ude. For example, the first night, meanwhile I was quiet and lonely in the corridor drinking vodka, she imposed me to go inside my cabin to sleep! 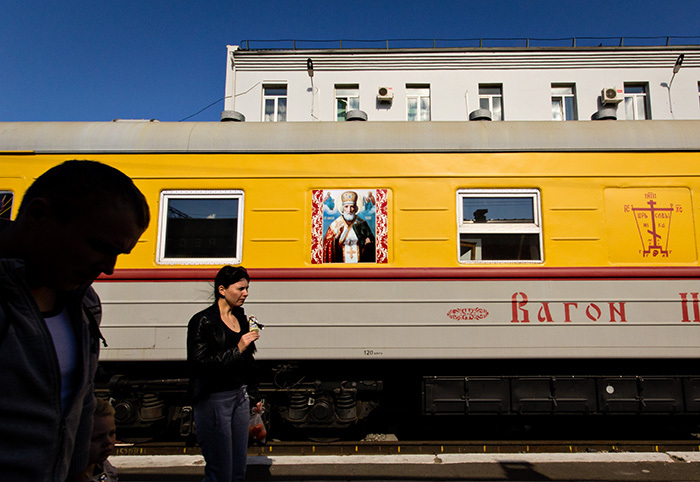 The first part I did on the train was the longest, two and a half days, from Vladivostok to Ulan-Ude. 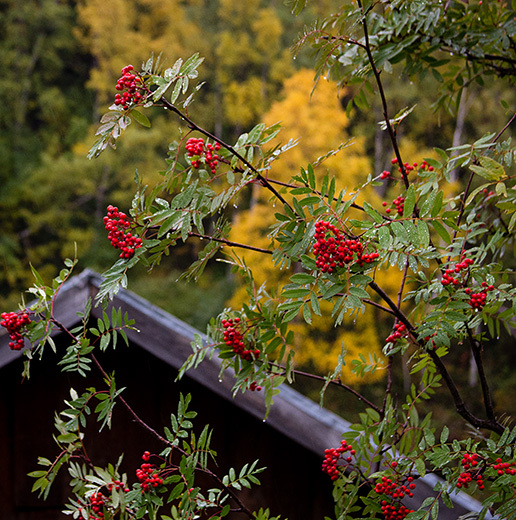 The first two days the window’s scenery was somewhat monotonous, a not very dense endless forest. The stations where we stopped usually were just a single sad building in middle of nowhere, with no shops or street vendors, but just a couple of guards and railway workers. On the third day, after a long dawn, we started to run along a river and the scenery became very spectacular. Shortly after sunrise, in the midst of the last puffs of mist that resisted the sun, on the river appeared strange birds and solitary fishing boats. 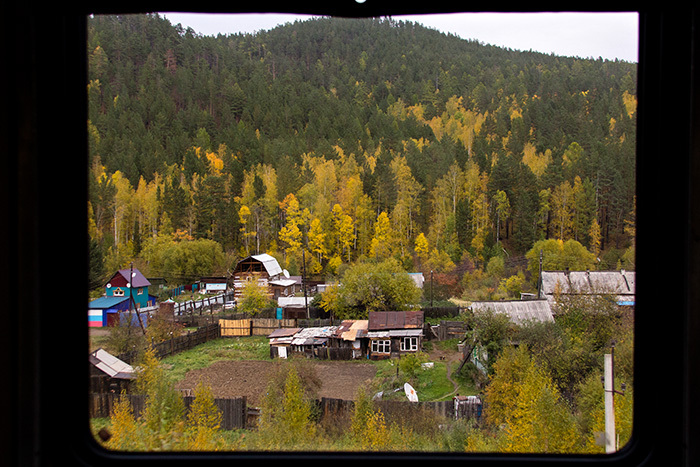 Hour after hour the colors become more alive and we began to appear the little typical Siberian villages of colorful wooden houses with sloping roof sheet. On the train the Russians were friendly but unfortunately they did not speak English, or just so little that was almost impossible to talk. In Ulan-Ude, where time seems stopped at the typical Soviet Russia. 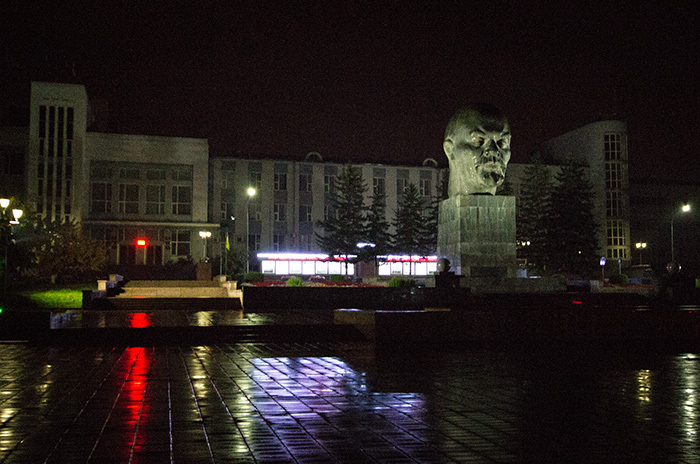 In a rainy and lonely square stands out an imperious head of Lenin, the largest bronze head in the world. The city is a few hundred kilometers north of Mongolia and in fact its population is largely of Mongolian descent, the Buryat. However, almost all Russian cities that I have visited have still today a statue of Lenin in the main square, not considering its disturbing mummy in Red Square. 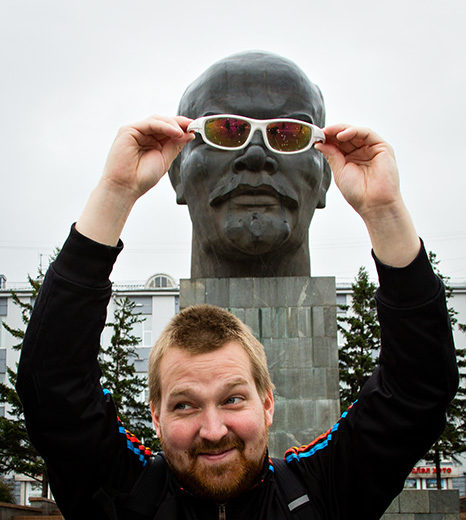 Since the Lenin head looks a little cross-eyed (and the reason is that locals asked his face to be more Asian-like, not kidding) we decided to donate sunglasses to the father of the revolution. The benefactor is the Finn Jaakko. 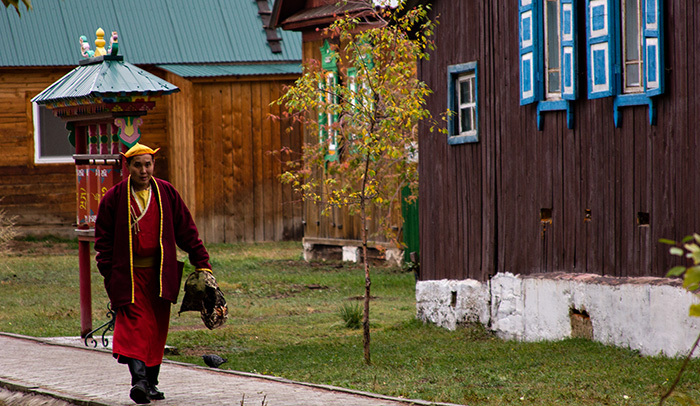 A Buddhist monk, in Ivolginsky Datsan, near Ulan-Ude. The complex consists of a dozen ornate temples, with inside spectacular and sometimes extravagant statues and figures of gods and demons of the Mongolian Buddhism. Often, it is clear the iconographic influence of Hindu deities. Strange to say, the Buddhist datsan was ordered by Stalin, for sure not a religions’ lover, to thank the locals for the commitment shown during the Second World War. Again on the train, this time from Ulan-Ude to Irkutsk. It was the most spectacular stretch because it was by side of Bakal Lake, the largest lake in the world. 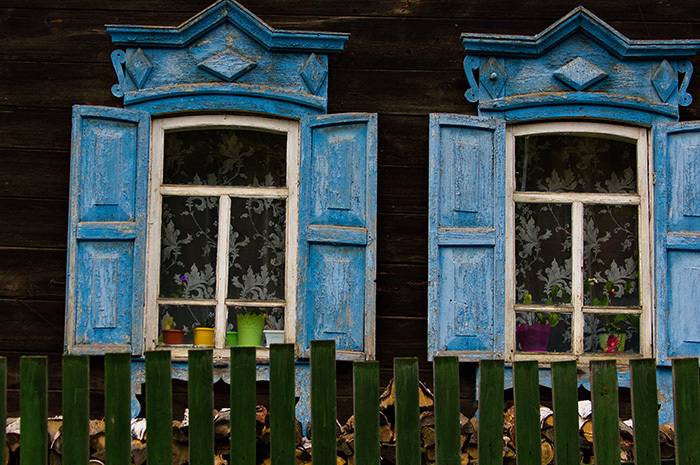 From the train window, Siberian houses. 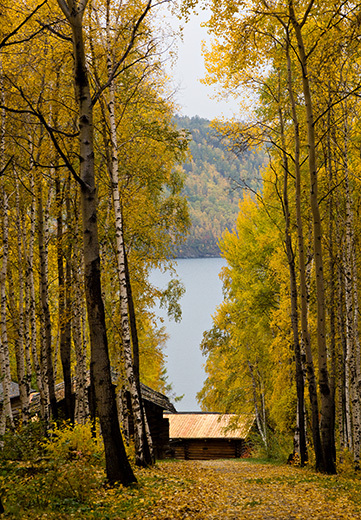 Huts in Taltsy, near Irkutsk, a sort of museum of old Siberian dwellings in the forest. In the background the Angara River, a tributary of Lake Bakal. 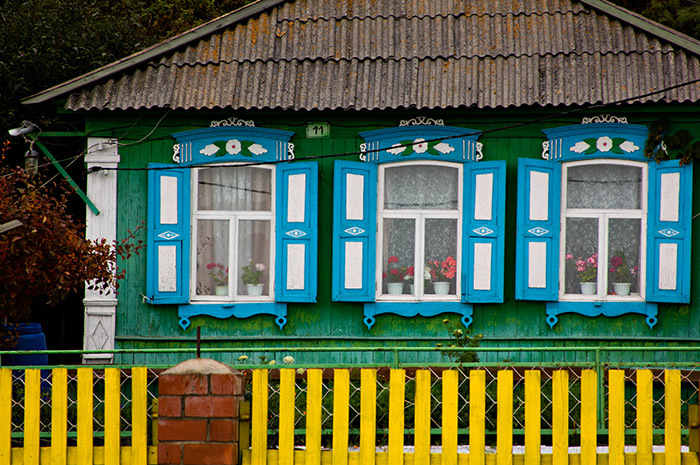 Typical Siberian house in Listvyanka, a small town by Lake Baikal. Back on the train. 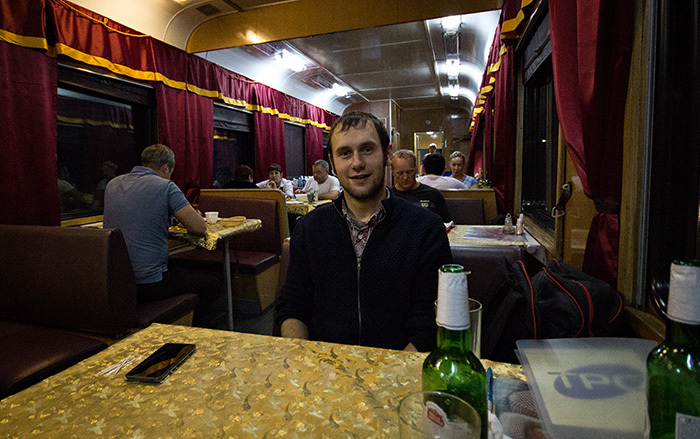 In the restaurant car sometimes I could meet someone who spoke English, as this Russian guy, Dmitrii, travelling for business reasons. 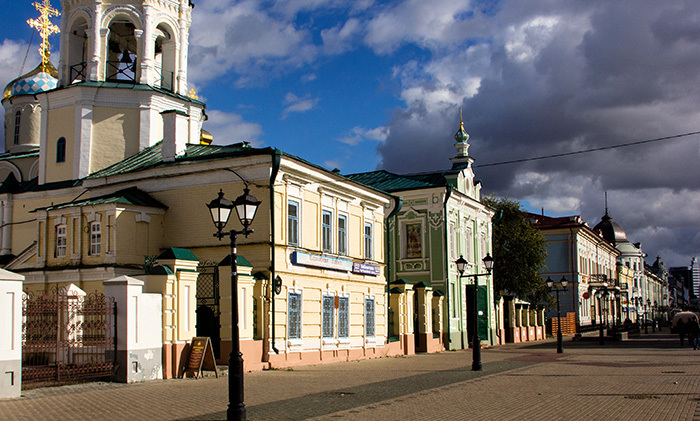 Tyumen, a neat and clean city. It was the first Russian outpost in Siberia. Today it is rich thanks to the oil of its region. I visited it thanks to a very kind guy from there, Denis, that I met in the hostel when I was in Moscow. In the evening we went to the town’s thermal spa complex with hot mineral water pools, saunas etc … he took also a bath in the river nearby, trying in vain to convince me to do the same … yes, in Malta I didn’t swim in the sea before the end of July because I felt the water was too cold, imagine if I went bathing in a Siberian river at night! I arrived on September 29 and it was Denis’ birthday. After midnight, we passed directly to celebrate mine. Luckily we were not in Wonderland where instead it is celebrated the not-birthday. In the upper left, Denis. 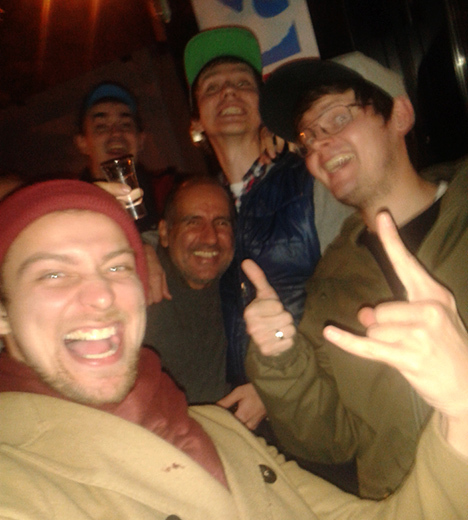 The guys on the right are two journalists and the one in the lower left is a musician. All extraordinarily friendly and intelligent. 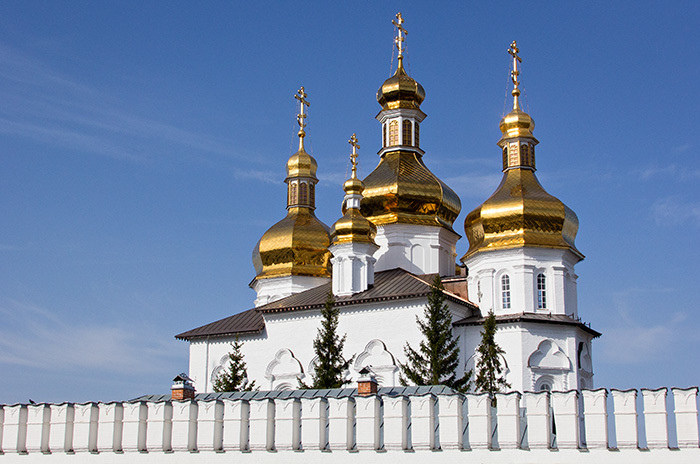 An Orthodox church in Tyumen. 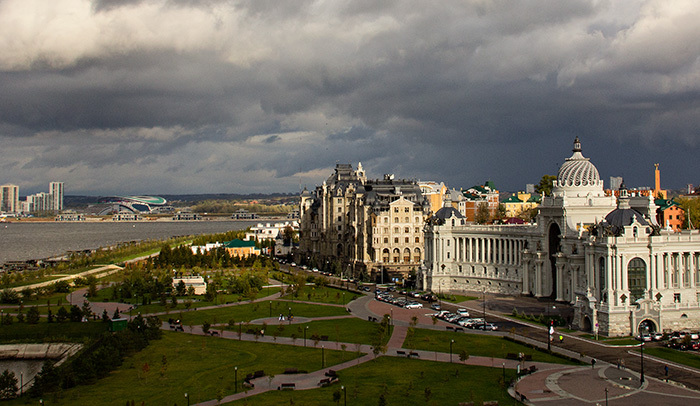 The beautiful Kazan, the former capital of the Tartars. On the left of the river Kazanka, shortly before flowing into the Volga. Alisa, a girl from Kazan that lived few months in Malta, where we added on Facebook, without meeting in person. And instead we met in her hometown! 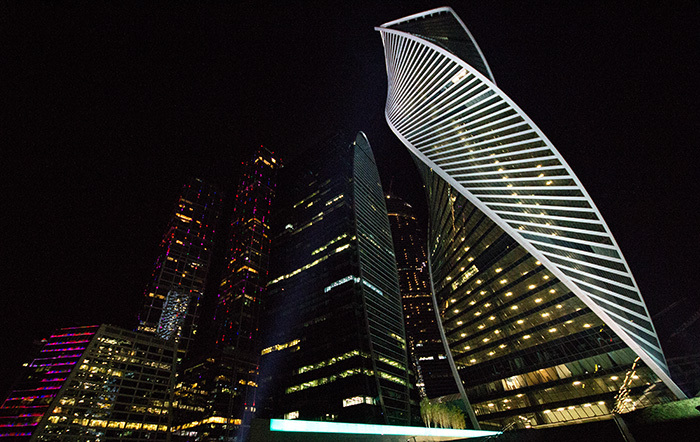 In the background, the illuminated buildings inside the Kremlin. 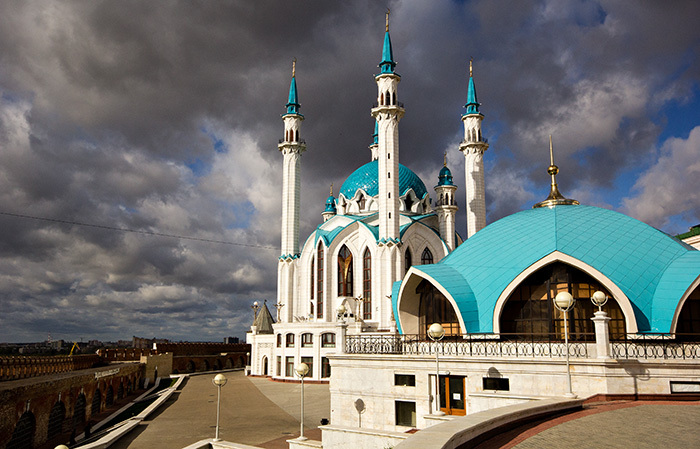 The mosque Qol Sarif, inside the Kazan Kremlin. Selfie in the mirror of the wagon of my last stretch, from Kazan to Moscow. I was lucky because I was alone in the wagon and the train was very modern and clean. The hardest part of my train journeys was, instead, from Irkutsk to Tyumen. 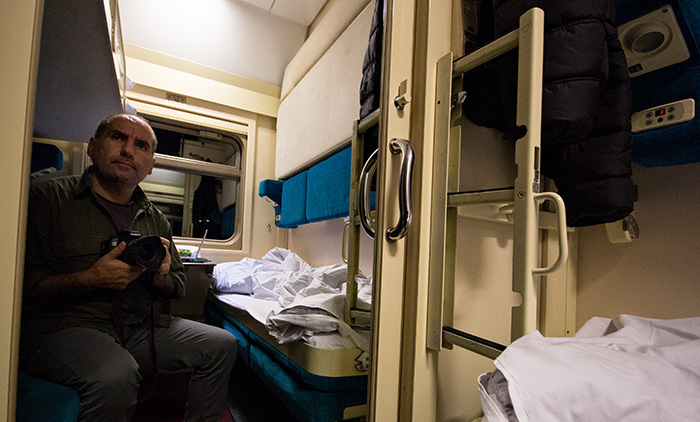 The train was old and shabby and I was in an open wagon, 4 people but no door, directly on the corridor where there were other beds along. A mess. 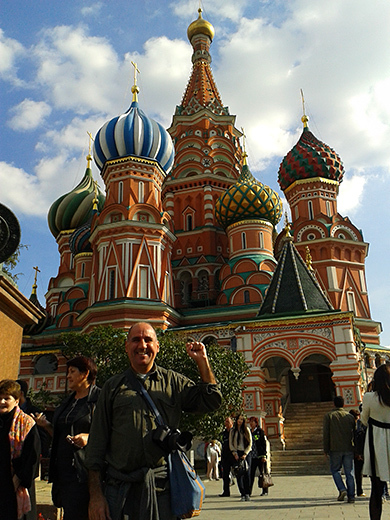 In Moscow, first and last stop of the journey, the workers are building the great Russia! 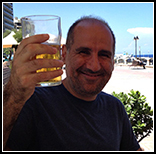 For this photo I was inspired by the avant-garde collage of Soviet propaganda of the ’30s. 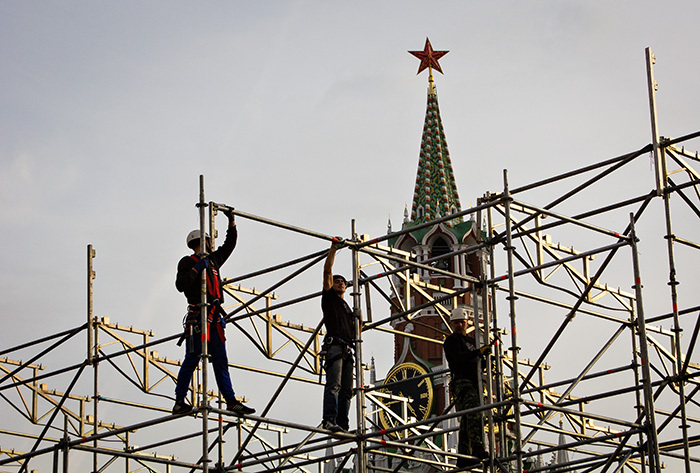 In this case they are preparing the scaffolding for a big parade in Red Square. This time not to celebrate Stalin, but the assignment of the World football Cup 2018 to Russia. Remove a religion, another religion comes. The last night in Moscow in the Red Square there was an extraordinary show. 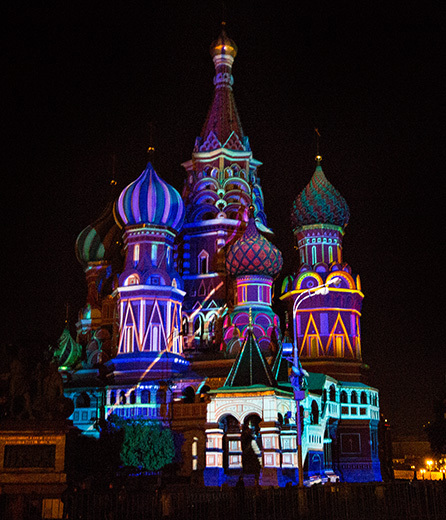 The St. Basil’s Cathedral was illuminated with lights and colorful pictures that transformed it like a in a fairy tale. Meanwhile, a voice explained its history. 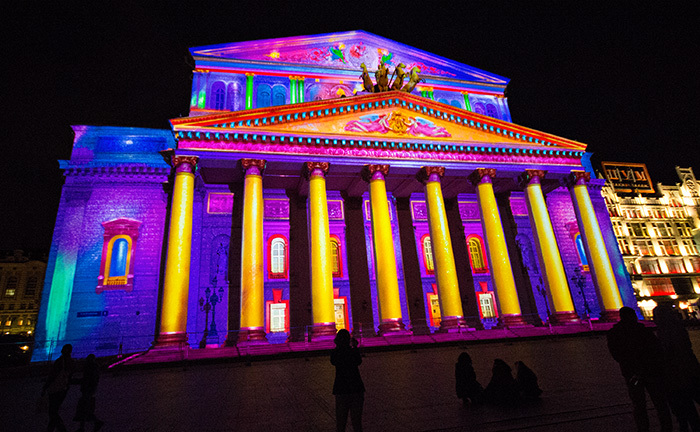 Also on the facade of a nearby theater there was a show of lights. Comrades, don’t despair! The victory is near!